The students witnessed an exhilarating experience at the Bananthimari Betta on 05th July 2015. Early Sunday morning the bus was packed and all set to go to Kanakapura town which is the nearest town to the hills. This Bananthimari hills are Located between the villages of Konanadoddi and Kuthnahalli just off the highway to Mysore. This hillock duo of Bananthimari is a scrubby beauty and the unique trail of Bananthimari Betta was indeed a trek of a life time. This route climbs up a hill with the most picturesque valley and a stream that rolls down its slope but as there was no rain so we couldn’t any streams rolling down but marks were still afresh. Around 7.00 am in the morning we reached the place with all the students and we were also accompanied by Mr Satish Kalra, Mr. Manu, Mr. Raj Chakraborthy, Mr. Sujit and Mr. Syed. All the arrangements were already done, all thanks to Mr. Vinay and team for their efforts. We had our breakfast and started to climb the stiff hill with a terrific pace and all enthusiasm. Amid the wonderful lush and green flora we started this thrilling and adventurous trekking expedition to the top. Soon we saw some amazing team work, kindness, helping hands, support, speeches, shouts and songs which was indeed very inspiring and motivated everyone to keep the pace and aim for the hilltop. Some fellow classmates helped the needy and stuck around them till the fleet reached the top. We took a small halt when we reached the half way, which was filled lushly with trees, bushes and rocks. Had our sip of water, few encouraging words by our own Raj sir and a lot of selfies as well as groupfies. While we kept an eye out for small mammals and reptiles throughout the trail as there are so many trees, bushes and rocks and caves. Soon enough we were again on our thrilling expedition all set to conquer the hill top. By 09.00 am we were at the peak of Bananthimari Betta which a rather flat rock surface with stunted scrub. What the flat peak of Bananthimari has to offer, however, are the most glorious winds and breathtaking views that surely blew off our feet. We had our group picture at the top and enjoyed the moment along with everyone, and then soon we again started to descend to the base. Again while we were descending we faced a lot of trouble as it was a stiff slope which was very difficult climb down. Soon we reached near a pond where Mr. Vinay and his team had arranged river crossing exercise which a lot of guys and gals participated and did it. Thereon we had a team building exercise which was a competition between two teams, both teams participated with all enthusiasm. 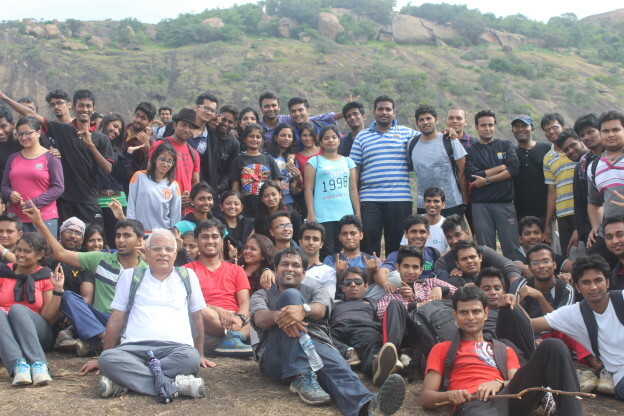 Thus the trekking came to an end with some wonderful memories here with all students and the faculties.